Yesterday's desert landscape has been the latest in a long series of attempts of grappling with one scene from my Spring holiday to the Negev. Following on from several on site sketches, pastel sketches, some more compositional pencil drawings and a round of gouache and pastel sketches to establish highlights, I still felt that the composition of what I started with was too complicated and unnecessary. I felt I was struggling with elements where each elements worked in its own right but not as part of the painting. Cropping the image on the left to leave out a difficult-to-read midground was my solution for the time being. It seems to work a lot better through this simplification. Click here to see the cropped image. This is what I did this morning. 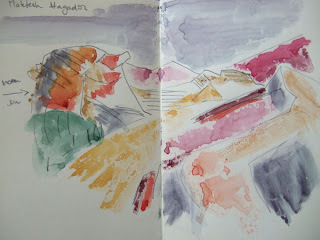 Having taken my camera with me, I took pictures of the process for this desert landscape. Step one: placing major shapes and colours with acrylics (brush and knife). I was particularly keen to get the rock faces (dark purple) placed and also to create the highlights in a light/mid value rather than too light. These are a couple of layers of acrylic washes. I mixed gloss medium with the acrylics to increase brilliance. There is a bit of wiping off, sponging on, splashing and scratching going on across the painting. Step two: working over the acrylics, I added gouache layers - to increase variation and add local colours, notably reds/oranges and greens. Step three: Adding pastels - creating texture; integrating colours: notably moving pale blue/violet throughout the painting, taking back some of the strong yellow/greens and to place some orange highlights; creating detail of ridge in foreground and defining rock in middle ground. Numerous responses by other artists and their approaches to titling their art follow the original article. Reading through these, I must admit I am a bit partial to Sheila Grabarsky's titling in series - the series that form the basis of her artworks are those relating to personal events in her life, such as the birth of a granddaughter, a new cat, a place she lived in and so on. As such, they are really diary entries and without immediate relevance to the actual piece of art. But for her, this also allows her to free herself of having to worry about titles. Some pieces get two titles, e.g. the WTTS #22 for my dad is also Am Abend - in the evening; others are a bit more associative such as Spring in the Sky; and finally there are some ironic one - such as The Runner (! ), or The Liar Selling Snakes at the Market (!!). 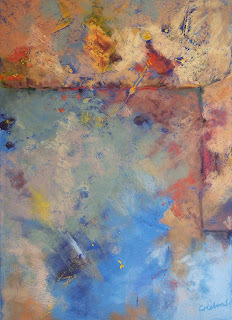 Yet, as for the more abstract pieces, I do wonder if it makes sense to be less descriptive of process or content. Here's the piece that triggered this line of thought... and: can you find the girl in a white dress on the wall? Earlier today I went back to the art sale to pick up the unsold paintings. I had known of two to have sold until Saturday lunch time. One was the one gone before we arrived at the preview, the other one was bought by my friend's mother for her. Marilyn had helped me take the paintings to the show on Thursday night and really liked the yellow one. The other two hadn't sold but I figured that was still pretty good to sell half of mine. When we went on Friday night, we had a good look around - there were about 240 paintings, mostly acrylics, some oils and some watercolours. There were very few pastels. Most of the paintings were in small formats - maybe up to 40x50cm. As for subjects, about half were landscapes with the others equally divided between still life and portrait/figure drawing. Almost exclusively, the subjects were rendered in a representational to realist style. It was only two other artists whose landscapes were explicitly taken up abstract elements. When my friend and I were there on Friday, she suggested to hang out around my paintings. The paintings weren't actually hung together but spread across the room - I am not quite sure if there was any reason behind the hanging, but felt it was a bit unfortunate that it wasn't one person's work to look at together. Yet, two of mine were closeish together in one corner. So, Hilda and I sat down there with our glasses of wine. And indeed some of the people would talk about my paintings. We ended up talking to one woman who really liked one of them, and she and her friends had already found the other of my paintings and noticed that one was missing. She didn't like the title - textured wall seemed far to prosaic to her, I think. But it was her and her friend's interest in my paintings that really made my evening. That was such a nice kind of feedback to get - thank you so much!!! I gave her one of my cards, and I think she and her partner were back the next morning when my other friend was there too. I realise that I did never post write about this painting though it has been part of the sidebar for a long time. I only framed it this week and took it straight from the framer to the drop off for the art sale. They hung it, but by the time we came to the sale it had already disappeared to its new home. So, my first painting to hang somewhere I don't know. Funny feeling, but quite nice, really. The painting was done on primed Bristol board, with an acrylic underpainting and plenty of yellow, red and earth coloured acrylic paint and ink splashes before I started with the pastels. There are a few directional clues and markers in there: edges and ceiling corners which could easily read as something else entirely. The relative smoothness of the primed (with pumice powder) Bristol board makes a much softer work surface than my other boards that tend to be a lot coarser. Still, there is plenty of tooth to grip the pastels. The ultramarine underpainting and the related soft pastel hues make this one rather calm and balanced - an effect that the earthy beiges, red-browns complement further. All the while, the red and yellow splashes shine through, create texture and markings that add interest and movement - not just along the corner lines but also across the whole painting. Found this outside the pub on the way home from the art sale... a piece of Glasgow living room on the pavement. And: I sold my first painting to a stranger!!! Thank you, thank you, thank you, Torben! The website is fully (as in 99%) up and running and my brother will be glad to hear that in future he won't get irritated phone calls from me, unjustifiedly questioning his programming skills. - But who would have thought how much skype in the background messes with my internet! Anyway: in time for the art sale for which I have to drop of the paintings tomorrow evening, www.ghelms.com is alive and kicking. It took me a time to upload the mixed media work and sketches but I hope I've picked some good ones. Please have a look - and please, again, crit and comments are really apreciated - both in terms of functionality and artwork. I've been doing a bit of digging around gouache techniques, resources and artists. I was hoping for an amazon one-click solution but was sadly disappointed. There seem to be very few technique books around. The one that is consistently recommended is that by Pamela Kay, Gouache: a personal view, Atelier 1995. Yet it looks as if it's difficult to get hold of (an Amazon price tag of £95 isn't very encouraging). Katherine at Making a Mark has written up an excellent post as part of her floral project on Kay's floral artwork, which is very much based on gouache. My favourite Saturday morning art group is back again, and while it will take a while to balance Friday evenings with Saturday mornings, it was exciting to be back - it's a great group of people and many of them have been going for a long time. I'm keen on doing more work with oils but am not quite in the mood for that yet. So, I took my tubes of gouache along - I got them as a present early in summer but still haven't tried them out - what have I been missing! It's funny how some media just feel right straight away and others just don't. From pastels I moved to acrylics and I remember vividly the intense frustration when everything just ended up as muddy, plasticky grey. In constrast, oil paints were just a revelation - their luminosity, the various oils and assorted accompaniments to go with them (even smelly turps) just add to the experience. So, gouache has been a plan to pursue for a good while - really as a means to keep mixing media with pastels, and there's plenty of artists who did precisely that - mainly Toulouse-Lautrec and Degas - to which I won't link now but make a mental note of yet another draft folder file. High pigment load and their ability to mix, remix and keep playing with makes gouache an exciting water-based medium. Their opaqueness (or is it opacity?) makes them ideal as underpainting for pastels - just see in the sketch above in particular with the blues and magenta where the intensity of hue would be difficult to achieve solely based on pastels. The painting is based on one of my outdoors sketches at my parent's place.... low in a field of grasses with a high horizon lines made up of trees - some cobalt blue would have been better for the sky, but there is always another time. The mixed media are gouache, acrylic ink and pastel. Here's to new paintings and explorations. This post has been lingering with intent in my draft folder since mid-summer. Written in part as response to my visit to Germany in July, it was initially called Familiar Criticism. Yet, as part of last week's visit to Germany I thought it was time to post and to rename. Much of my cloud studies were done in haste: noting down quickly the fast movement of clouds, sun and shade above the roofs opposite my flat. Because of its nearness and small window to the sky, the formations changed even more rapidly than the usual West Coast breeze makes them change in any case. Often, it took me three rapid sketches to get to a some of the patterning that I was after. Similarly, when painting outside in summer in the Highlands - the key was to get down quickly that what was going to change even more quickly: sun/shade and clouds - the impressions rather than the structures. The challenge of working fast is one that I enjoyed very much. And it is here that the familiar criticism comes into play: it's the experiences, knowledge and along with them assumption of one's personality and character traits that are being applied to something new - in this case, my paintings. So, following a couple of days teasing of how fast (and in my family that also means: impatient) I was, it started to grate... the stories of me going through five paintings in kindergarten stopped being funny. Excessive sensibilities on my part? I'm not too sure. And it was this tension between movement, speed and stillness that I got reminded of when walking last Friday through an autumnal countryside. In particular: how slow the sky was moving... there was a huge sky - views up to the horizon line and everywhere I looked movement was slow, almost difficult to figure out: clouds remained almost stationary, shade fell in the same spots for long times. Of course, the clouds were moving, but much slower than what I got used to. Now: the big question is whether I would draw them any slower than I got used to? Well, I need to try that out the next time. Again, though it was an insight into the responsive way of doing art - so much of my sky studies resulted from the position to paint chosen, the materials chosen and the speed with which clouds tend to move across Glasgow. Imagekind is a US-based website selling posters and prints. Several other artist bloggers such as Vivien at Paintings Prints and Stuff and Katherine at Making A Mark have been writing about it and recommending it for an easy to use, good quality print-as-you-go business. I have had some business cards and postcards made recently in preparation for the upcoming art sale, been distributing them eagerly and thought I'd try and see about the quality of poster prints from some of my photos. So, as a new sidebar addition, you can now go and buy some of my paintings as prints. I've been toying with the size of file and quality of the print outs - and it seems to work pretty well. I can buy back prints as and when I want to - I tried different sizes and quality of paper - their standard enhanced matt poster stock is very good, and their more expensive Hahnemuehle Torchon gives a clear crispness to the pastel paintings which is excellent. .... are the results of academic endeavour. I've always liked the vagueness of the English term - in German it is much more often the Results section that concludes and brings to an end what has been undertaken. Findings, by contrast, can be the incidentals and unexpected treasures one stumbles upon. So, as no surprise, going into the woods near my parents' place and looking for mushroom is great - any time of the year, really. The fun of it lies in the never knowing whether there'll be some mushrooms ... findings as sought after, yet not given. One of the first things my friend said on Friday when we set out for a long sunny afternoon walk was: Maybe we'll find something! So, apples were picked, sloes were eaten and plenty of pictures taken. No mushrooms but hey, it's about findings when foraging. ...unsurprisingly given the findings headings: Found objects in collages and mixed media are an immediate link to the 'having stumbled upon' of my fondness of mushrooms. But as for work process there is another link: a piece of art as a finding rather than a result - findings as it's the process of making art rather than the intentional outcome. And all the same while planning, preparing and intending to do something (which I in general do a lot, really), it may be something else that becomes significant about that particular piece. 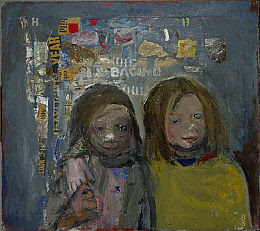 The National Gallery in Edinburgh is going to hold a major retrospective of Joan Eardley - a Scottish figurative and landscape artist whose work presents an important contribution to the move towards abstraction in mid-c20th European and Northamerican art. I'm very excited about this, as Eardley has been one of the most fascinating artists I discovered during the last year. The exhibition will open on November 6 and last until January 13 in the National Gallery complex. Eardley's studio was located during the late 1940s in Glasgow's Trongate in the East End, and from here, her works of the children of the East End give powerful testimony to the life in inner-city tenements... a kind of visual urban ethnography of postwar Glasgow. 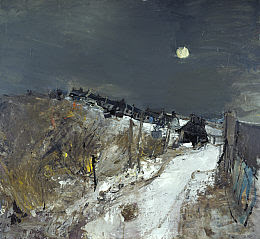 From the mid 1950s onwards until her death at only 43 in 1963, Eardley divided her time between the small fishing village of Catterline on the Scottish north-east coast and Glasgow. As for the Eardley exhibition - they are offering a short course during the exhibition. Called Bits and Pieces, it is based on one's exploration of the exhibition and on experimenting with collage (that's the bits and pieces bit) both for landscape and figurative work. That'll mean trecking across the Edinburgh after work, but it will be more than well worth it, even just for having the opportunity to explore the exhibition four times! I will write more about this in due course and am currently just savouring the anticipation. 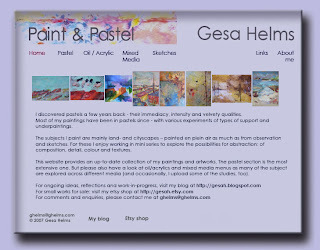 Casey Klahn - whose The Colorist blog had been one of my early finds full of insightful posts on art process and works in pastel - has recently set up a new blog: simply called Pastel, this new blog promises to develop into a rich and resourceful site for all things around pastel. 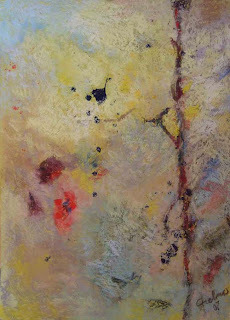 Casey's abstract pastel works are excellent and his photos of soft pastels in boxes are just a perfect illustration of why I'm so found of the medium myself. Just have a look at his banner at the Colorist to get a sense of where his explorations of New School Color and abstract expressionism are taking him. this blog was live from june 2007 until october 2011.
cluck cluck the chicken moves. here and there. paint. pastel. pain. the pastoral.